As we walked into a packed, sold-out stadium, we could almost smell the excitement in the air. Judging from the miles-long line of cars extending on to the freeway and the throng entering the venue, this was clearly no ordinary night. For some, it was the event of a lifetime. 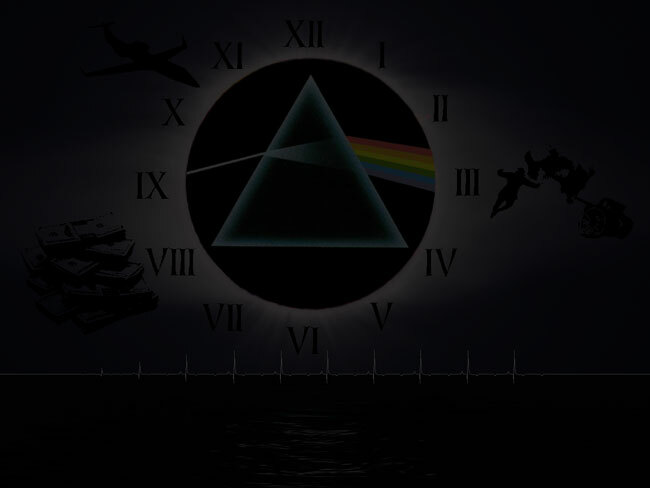 Roger Waters, founding member and bassist of Pink Floyd, was going to perform their groundbreaking classic, The Dark Side of the Moon, in its entirety. Picture this. On stage, you see the now-familiar Floydian screen. There's an amazingly sharp picture of a fifties-style radio with a model airplane on it, a bottle of scotch with a glass, and an ash tray with a cigarette - filled with so many shades of brown and amber, it might even be sepia-toned. Almost imperceptibly, the picture comes to life as smoke begins to swirl up from the cigarette, and a hand pours some scotch into the glass and replaces it half empty. It picks up the cigarette and takes a drag as smoke machines fill in for the absent exhalation. The hand turns the large dial on the radio. The first song we hear is a scratchy, static-filled “We'll Meet Again”, by Vera Lynn, recognizable from The Wall. Next, we hear Elvis' “Hound-Dog”, followed by Abba's “Dancing Queen”, which is quickly cut short as the radio is retuned to “My Funny Valentine”, which is played to its finish. Then, for a few milliseconds, which feel like hours - dead silence. This is utterly shattered as the Emperor of Floyd walks on to the stage accompanied by the adrenaline-charged, distortion-laden slide guitar and drums from the opening of “In The Flesh”. The screen displays marching hammers. Fireworks erupt on stage. The crowd erupts into wild and ecstatic cheers. After his performance with the rest of Pink Floyd at Live 8, Waters expressed an interest in revisiting the classic Pink Floyd album, The Dark Side of the Moon. Performed in Europe and North America, The Dark Side of the Moon tour consists of Waters playing a spectrum of songs from early Floyd to his more recent solo work in Set One, followed by a performance of the entire The Dark Side of the Moon album in Set Two. In the 1960s, Pink Floyd used to project surreal images from a slide projector on to a regal Syd Barrett, performing on a giant pillow in the middle of a resplendent stage. In the 1980s, they used to construct an entire wall, brick-by-brick, between themselves and the audience as they performed The Wall. 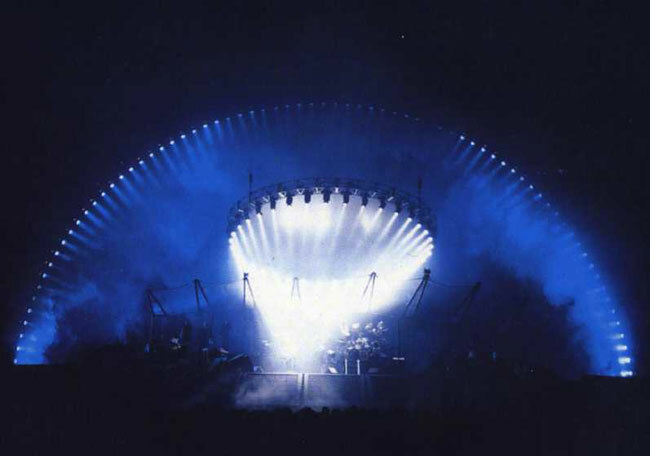 Throughout their careers, Pink Floyd and Waters have been pioneers in immersing their audience into a complete audiovisual environment during their live shows. This show was no exception. “Mother” was followed by “Set the Controls for the Heart of the Sun” from Floyd’s second (1968) studio album A Saucerful of Secrets, which included a few Syd Barrett songs. Barrett was one of the founding members who left shortly after the band’s inception, before their rise to fame, because of mental problems stemming from his excessive psychedelic drug use. At points the screen showed what I thought were black-and-white snippets of Syd running and jumping in some fields. It continued on with “Have a Cigar”, with a “bright lights, big city” kind of montage on the screen. Like the lyrics, the visuals displayed the effects of a small-town artist enveloped by fat cat big-city producers, who smoke cigars. Also like the album, the song abruptly morphs into radio, and the screen shows the original still life with the vintage radio which, after some tuning by the hand, plays a tinny version of ‘Wish You Were Here’ exactly as it sounds on the album. Notably different from the original, however, was the background vocalists performing a bluesy version of the chorus, acting as a bridge in the middle of the song. During the guitar solo, the screen showed candles in memory of Syd. The next few songs were numbers from Waters’ solo albums and although I am not a big fan of this part of his career, it was entertaining nonetheless. These included “Southampton Dock” and “Fletcher Memorial Home” from The Final Cut. During “Fletcher Memorial Home” an inflated astronaut was sent floating around the stage. He also sang a 2005 track, “Leaving Beirut”, about his experience as a teenager in Lebanon. The song’s lyrics are interspersed with spoken word commentary reflecting Waters’ strong stance against the Iraq war. For the show, the spoken word parts were displayed on the screen, somewhat like a graphic novel. There was certainly a left-leaning political coloring to the entire show, reflected in occasional anti-war propaganda on the screen, and alternating with the surreal imagery. Songs from The Final Cut, which has a strong anti-World War II slant, reinforced this. Waters lost his father in the Second World War and since The Wall, his anti-war views show up in his songs. I heard there was concerted booing during some shows, especially during “Leaving Beirut”. In this bluest of blue states, and in a significantly left-leaning city, there were rampant and united cheers every time Waters made an anti-war statement, musical or otherwise. The last song in the first set was ‘Sheep’ from Animals. Following a classic Pink Floyd tradition, an inflatable pig was released into the air. Left from the stage, it floated from the rafters out on to the lawn and then went hundreds of feet into the air. The graffiti included ‘Impeach Bush Now’ scrawled across its backside. The magnificent spectacle was a grand ending to the set. The second set consisted of Dark Side played in its entirety. Starting with the familiar heartbeat, onto which all of the album’s songs are superimposed, the entire performance was fantastic. Words fail to describe the perfection with which the album was replicated on stage. The excellent line-up backing Waters included the band’s three guitarists, with The Who and Clapton accompanist, Andy Fairweather-Low; ex-Thin Lizzy member and a regular with Pink Floyd since 1977, Snowy White and Dave Kilminster who, along with Jon Carin, excellently filled in Dave Gilmour’s vocals. Drummer Graham Board shone in an extended solo in “Time”, and Jon Carin’s virtuosity was revealed in “Us and Them”. The significance of the song in this time of war was not missed by either Waters or the audience. Carol Kenyon blew everyone away with her rendition of “Great Gig in the Sky”. The alarm clocks in “Time”, the cash registers in “Money” and the constant maniacal laughter floated out towards the audience, enveloping them in quadraphonic sounds. The visuals were fantastic, with the set beginning and ending with a close-up of the moon. The set ended fittingly with a group bow. Waters was at the center. After some wild applause, the group came back to perform “The Happiest Days of Our Lives” and “Another Brick in the Wall II“, along with “Vera”, followed by “Bring the Boys Back Home”. The band ended with a magnificent extended version of ‘Comfortably Numb’ during which everyone held up their lighters. It was amazing how everyone in the audience sang along with Waters, word for word. Caught up in the moment, I was no exception. For someone who has been listening to Floyd since the age of twelve, on old cassette recordings, this was an epic moment in my life. Waters, to say the least, did not disappoint. After last year’s Pink Floyd reunion on Live 8, everyone was hoping for a tour. This certainly comes in at a close second. Waters left all of us comfortably numb.